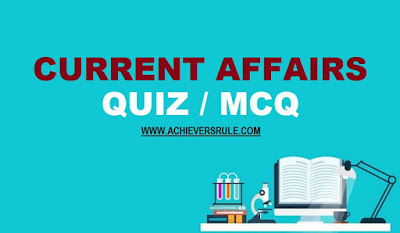 Solve the Daily Current Affairs Quiz - 27th December 2017 to judge your preparation for IBPS, SSC exams. The quiz set consists of recent updates regarding appointments, awards, agreements, schemes etc. Q1.Which country has built the largest amphibious aircraft of world AG600 ? Q2.Which state has launched the Kisan Uday Yojona ? Q3.The Central Board of Secondary Education (CBSE) is set to start a value education programme called "Awakened Citizen Programme" which have been prepared for both students and teachers with ____. Q4.Vice President Venkaiah Naidu Inaugurates Centenary Celebrations Of The Yoga Institute. It is situated in which city ? Q5.______ has launched a free household power connection scheme for the poor in the state to mark former prime minister Atal Bihari Vajpayee's birth anniversary. Q6.Five-day Teesta Rangit Tourism Festival 2017 in ______ to revive tourism in the hills . Q7.Who has launched electronic-Human Resource Management System (e-HRMS) on Good Governance Day ? Q8.Which of the following has published the Asia-Pacific: Trading and Thriving Report ? Q9.The scientists of which institute have created solar-based cold storage for produce ? Q10.Which Bollywood actress has been named as the "PETA's Person of the Year" for 2017 ? Explanation 1. China conducted the maiden flight of its domestically developed AG600, the world’s largest amphibious aircraft, from an airport on the shores of the South China Sea. This is the latest step in China's military modernisation programme. Explanation 2. Uttar Pradesh Government is going to launch Kisan Uday Yojana for farmers. Subsequently, farmers will receive energy efficient pumps sets of different capacities. Explanation 3. The Central Board of Secondary Education (CBSE) is set to start a value education programme called "Awakened Citizen Programme" which have been prepared for both students and teachers with Ramakrishna Mission. Explanation 4. Vice President Venkaiah Naidu Inaugurates Centenary Celebrations Of The Yoga Institute in Mumbai. Explanation 5. Uttar Pradesh has launched a free household power connection scheme for the poor in the state to mark former prime minister Atal Bihari Vajpayee's birth anniversary. BPL card holders, those without a roof or having less than Rs 35,000 as income a year are eligible. They can get get connection by paying Rs 550 only as against the earlier Rs 10,000. Explanation 6. Five-day Teesta Rangit Tourism Festival 2017 in Darjeeling to revive tourism in the hills The festival will be held in phases in different hill towns across the two districts of Darjeeling and Kalimpong. Explanation 7. Dr Jitendra Singh launches electronic-Human Resource Management System (e-HRMS) on Good Governance Day . He launched it during the observance of Good Governance Day by the Ministry of Personnel, Public Grievances and Pensions. The Minister launched the 25 applications of 5 modules of the system. Explanation 8. Grant Thornton LLP has published the Asia-Pacific: Trading and Thriving Report. Explanation 9. Engineers at the Indian Agricultural Research Institute (IARI) in New Delhi have developed a solar-powered on-farm storage structure that can increase the shelf-life of fruits and vegetables in regions where cold storage facilities are absent. Explanation 10. Newlywed actor Anushka Sharma has been named PETA’s Person of the Year by animal rights organisation People for Ethical Treatment of Animals (PETA) 2017.